This is how I started making soap! Shampoo bars are a revelation once you start using them. If you buy a 100% natural shampoo bar you can be absolutely sure that none of the precious oils in your hair which keep it strong, vibrant and healthy are stripped away. You hair will be clean and shiny without needing product of any sort to give it life, bounce, shine, stop it being frizzy. It even seems to improve your natural colour, which I guess makes sense. 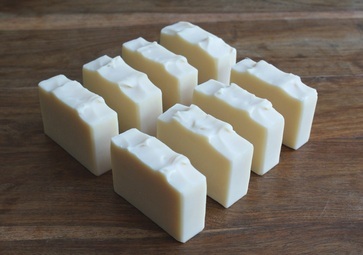 They are made with ingredients which will keep the bar hard (as long as they are kept dry) and provide loads of cleansing creamy lather, which is so mild and natural that it is also completely safe for face and body. Because of their multi-tasking properties, they are the perfect solution for travelling, going to the gym, going on holiday etc as one bar does it all. The switch takes commitment though and you will need to read up about what will happen in the first few weeks of ditching your shampoo bottles. It is really worth sticking with them as the benefits are quite miraculous and liberating! If you want to know more about the `No Poo' method (which involves throwing away your shampoo bottles and going cold turkey for a month to 6 weeks until your hair reaches equilibrium), please read my Q&A page. Please feel free to contact me if you have any questions at all and I may add them to the Q&A sheet if of wider interest. There is also a lot of information on line. I did it and it and no joke, it changed my life! If you would like to go half way, before plunging in, shampoo bars are for you. I use them once or twice a week, sometimes twice a month now to give my hair a good clean. That's all it needs. You can get your hair wet as many times as you like without actually cleaning it and you won't get frizz. They are perfect for wavy or curly hair. Contact me if you have any queries. If you're not used to shampoo bars, lather the bar in your hands or what I do is rub it gently on the hair at the roots and lather it up. I then leave it for a minute or two before rinsing. No need for conditioner. When wet, your hair will `feel' drier than you're used to, but by the time it has dried, will feel very soft and silky and after a month to six weeks of using them, you'll never want to go back to conventional shampoos. That's a promise. *After you have gone through the 4-6 week initiation, you can dye your hair, go to the hairdresser and have them shampoo it and your hair will go back to its former natural healthy condition after around 7 -10 days. "I thought you would like to know I have not bought shampoo or conditioner since changing to your soap bars, and my hair is now much healthier and easier to manage, it now does as it is told for me"
"Your shampoo bars are a revelation! - I am in my 60's, and for decades have struggled with thinning and lifeless hair. None of the commercial products really made any difference, and I coped by keeping my hair short. After a couple of months of using one of your shampoo bars, my hair feels transformed. It is squeaky clean after shampooing - but feels stronger, with body and vitality. I am letting it grow longer again now, and enjoying the bounce and waves. I can really see, in retrospect, how the commercial shampoos, conditioners and styling mousses etc that I used were stripping the hair of health and vitality. My favourite bar (so far!) is the silky castile - which also works very well for my dry and sensitive skin. I know this probably sounds like an advert, but it is genuine feedback from a genuine customer. I am just so enthusiastic about the shampoo bars, I want everyone to try them for themselves! Well done, Juliet - fabulous products! Please see more wonderful feedback from some customers on my Feedback page.